A funny thing has happened to me recently. You may have even noticed this, if you’ve been following my blog for some time. In the past couple of months I haven’t posted a lot of recipes containing truckloads of butter or mountains of sugar, have I? With the exception of those Nutella-stuffed cookies in honor of World Nutella Day, most of the recipes I’ve posted so far this year have had minimal amounts of sugar, or are simply completely free of refined sugars altogether. I never had plans to go down this path; it just sort of happened. A couple of my friends have been the inspiration behind my recent focus on more healthy-ish foods. When I started trying out some of the recipes I found for raw food, or refined sugar-free foods, or even gluten-free foods, I was surprised to discover that they were just as tasty as, if not tastier than, the unhealthy stuff. So that funny thing that happened to me? I don’t even want to eat a cake that is heavy with butter, or a cookie that is laced with white sugar. I don’t have any desire to eat that stuff. I think it’s true now when they say that when you cut out refined sugar, your desire for it eventually decreases. I do still use sugar in my coffee, but it’s only about 1/2 teaspoon. Otherwise, my sugar jar has remained almost untouched lately. My husband has even brought home packages of Tim Tams on special at the store, thinking they’d be a great treat for me. You know what? The only time I touched the Tim Tams was to move them from the shopping bag to the pantry. He is the one that ate the entire package, because I just simply had no desire to eat them. My birthday was last week, and I tried to make a batch of brownie cookies with peanut butter filling, even though the thought of actually eating even one cookie sandwich made me feel ill. When the cookies came out of the oven looking a little “under the weather”, I had to toss them out. I was actually thankful. However, I am a girl of tradition, and while I was on a sugar-free kick, I had to splurge and eat something sweet for my birthday. I didn’t have time to start on another batch of cookies or make a cake from scratch, so I quickly grabbed a cake from the shops to celebrate. Wow. You wouldn’t believe how I fought myself with this. I forced myself to eat a slice, along with everyone else. It was really, really good. But yet, I still hated every bite. I should not have bought that cake. But what is done, is done. 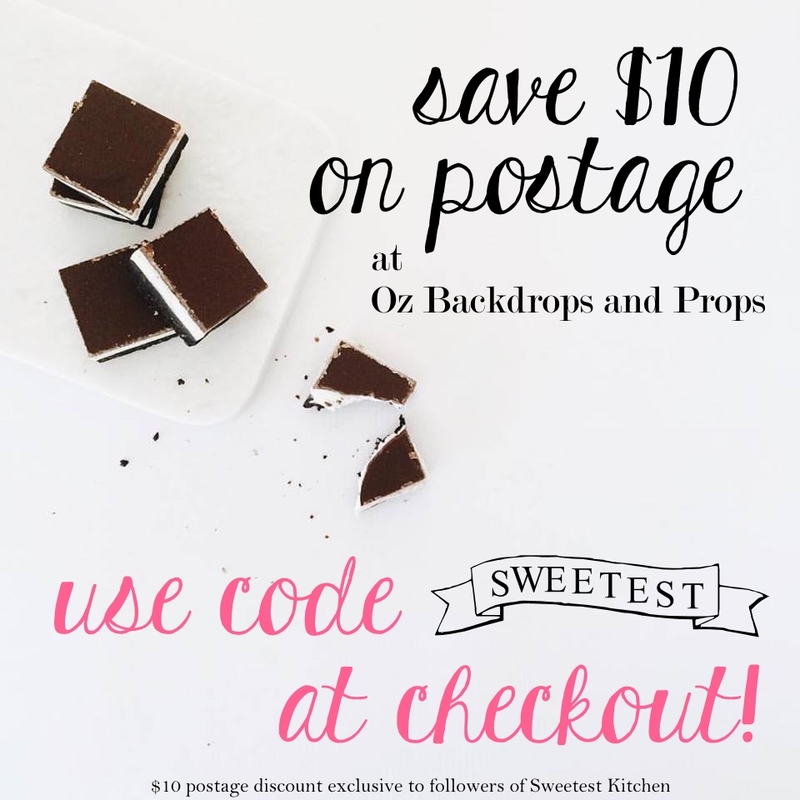 So what have I been using to sweeten the foods that I am making? Pure maple syrup. Honey. Medjool dates. While these are still sugary, I do believe they are slightly better for a body than refined sugar. Everything in moderation, though. The recipe I’m posting today is the first “healthyish” baking recipe I’ve made (as opposed to the raw foods I’ve made lately). It proves to me, yet again, that foods without sugar or dairy can be really delicious. 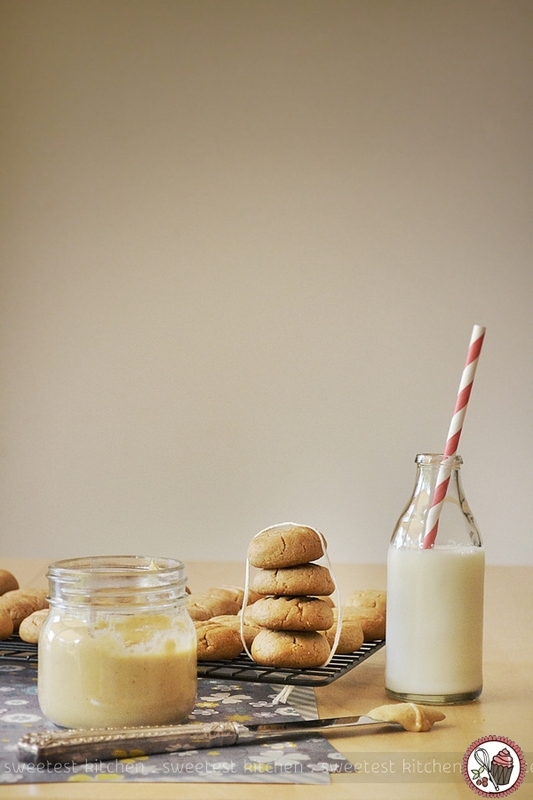 These peanut butter cookies (from Nutritionist in the Kitch) are made with spelt flour, homemade peanut butter (using peanuts only, no added oil, salt or sugar), tahini, pure maple syrup and coconut oil. And they are fabulous! They have a stick-to-the-roof-of-your-mouth quality that is so addictive! 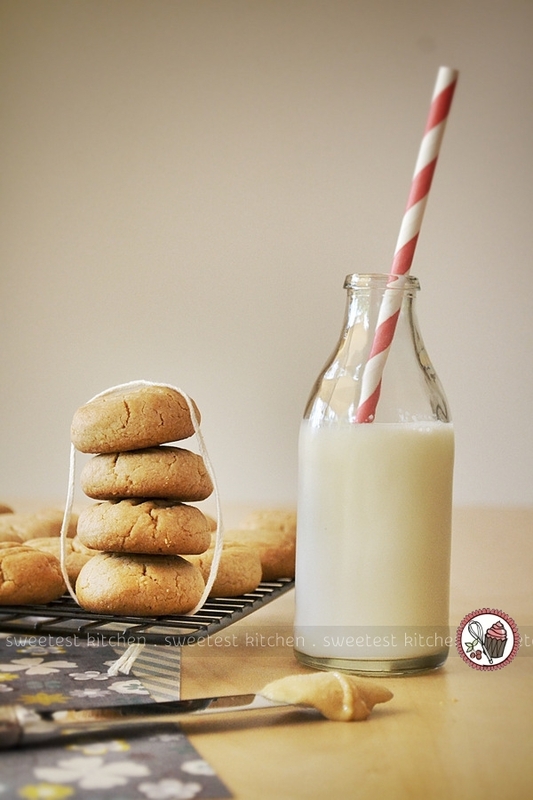 While this is still a cookie recipe and should be enjoyed in moderation, as Christal points out in her post at Nutritionist in the Kitch, this is a better alternative to the traditional peanut butter cookie. 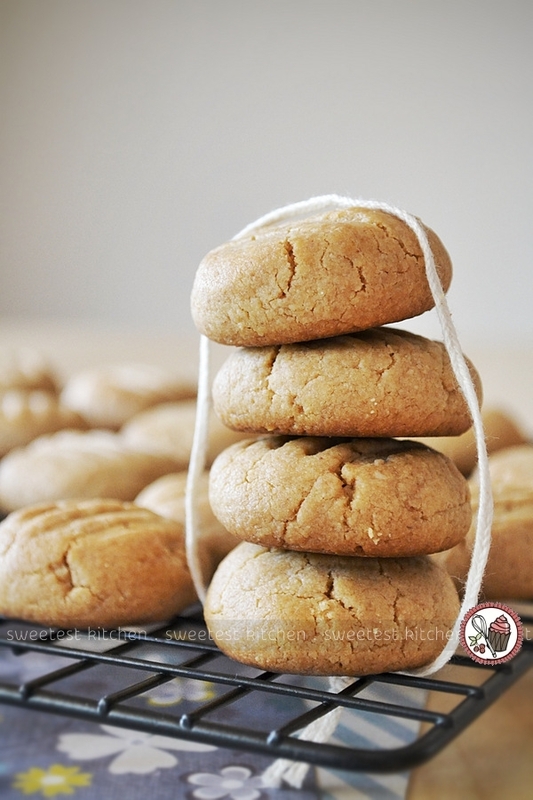 So if you are like me and love your peanut butter cookies but want a healthier option, definitely make this recipe. Spelt is an ancient grain widely recognized for its many health benefits. Triticum spelta, the scientific name for spelt, is a hardier and more nutritious cousin to modern wheat (Triticum aestivum). Some taxonomists classify spelt as a parent of wheat. One of the earliest domesticated grains, spelt hasn’t changed since Biblical times. It remains unaffected by concepts such as ‘agribusiness’, ‘cross-breeding,’ ‘hybridization’ and ‘genetically modified’ – words that have come to dominate our modern food supply. Known for its slightly ‘nutty’ flavor, spelt has long been popular as a health food in Europe, where it is sometimes known as ‘farro’ (modern Italy) and ‘dinkel’ (Germany). Some of the earliest recordings of spelt appear in the Bible (Exodus 9:30, Isaiah 28:25, and Ezekiel 4:9). It is widely believed that farmers grew spelt as long ago as 5000 BC in the region then known as Mesopotamia – now Iran. As civilizations migrated westward, spelt moved along with them. It wasn’t until the early 1900’s that spelt migrated to North America – in 910 more than 600,000 acres of spelt were harvested annually in the U.S. alone. Read more about spelt at Nature’s Legacy. Sounds good, right? The only downside that I can see is that spelt flour is more expensive than regular flour, which is definitely going to prevent me from buying it very often. I had to try it out at least once though! And yes, I did make my own peanut butter for this recipe. I was this close to using the jar of commercially-prepared peanut butter – and I mean, I was literally about to spoon it out and add it to the rest of the ingredients – when I suddenly remembered I had an unopened bag of plain unsalted peanuts. In a matter of minutes, the store-bought peanut butter was back in the pantry and I was then pouring freshly prepared peanut butter in with the other ingredients. If you don’t know how to make your own peanut butter, don’t worry. All you need is a good food processor and a bag of peanuts. I always use unsalted, and I roast them in the oven (on a parchment paper-lined tray, in a single layer, at about 180C for 15 minutes or so, stirring once). Let the peanuts cool, if you’ve roasted them, and pour them into the food processor along with some sea salt to taste. Process for 10 minutes or so – you’ll need to stop and scrape the side of the bowl often – until the peanuts become the consistency of, well, peanut butter. Be patient, as it does take a while to get to that peanut butter stage. Store leftovers in the refrigerator. 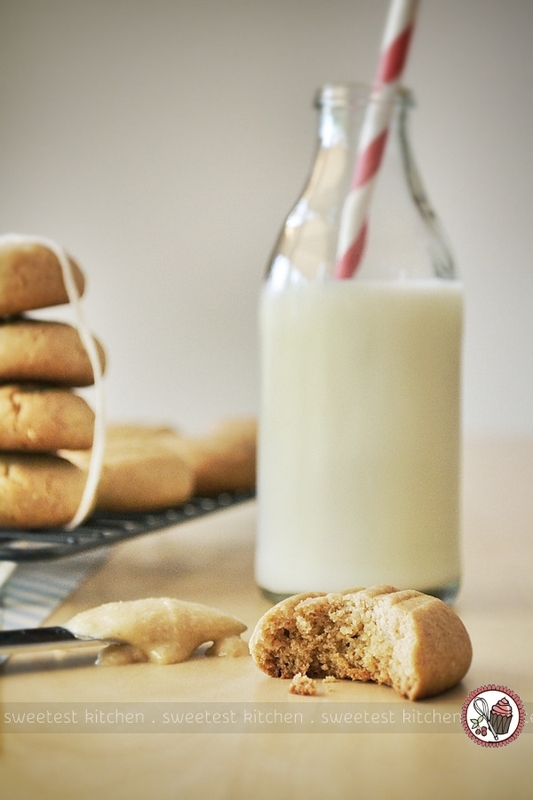 If you’re making homemade peanut butter for this recipe, use about 2 cups of peanuts. You’ll have some peanut butter leftover, thank goodness, to gobble up at another time! 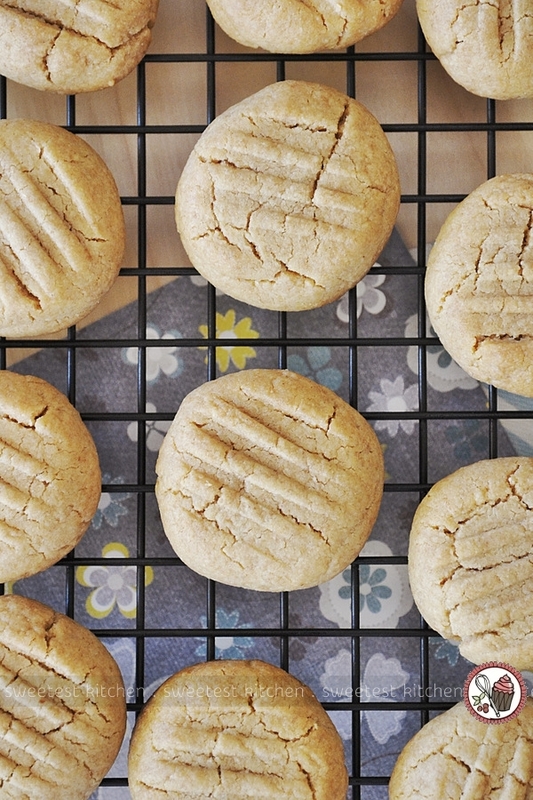 The texture of these pretty little morsels is crumbly, sort of like a shortbread. There are little crunchy bits from my homemade peanut butter (my food processor isn’t the greatest and it doesn’t get the peanut butter completely smooth), and it sticks to the roof of your mouth, just like real peanut butter! I made my cookies a little smaller than the original recipe, I think. I measured out each ball of dough to between 15-17g, which is about a rounded 1/2 tablespoon. The recipe says it yields 24 cookies, but I got 35. Don’t over-bake these cookies. I baked mine for 10 minutes exactly and they were perfect. They will still be soft when they come out of the oven, but will harden as they cool. I didn’t intend to write such a long post, but I did want to explain why you haven’t seen extravagant recipes full of butter and sugar in the past months. If you are thinking of trying spelt flour for the first time, or have spelt flour leftover, come back in the next week because I have a really delicious recipe for spelt banana bread with walnuts and dates in the works! Preheat oven to 180C (350F). Line baking tray with parchment paper. Mix spelt flour, baking soda and sea salt in a large bowl. In a separate bowl combine peanut butter, tahini, maple syrup, coconut oil and vanilla. Pour the peanut butter mixture over the flour mixture and fold to combine. Drop small rounded balls of dough (each of my dough balls were 15g-17g, or about a rounded ½ tablespoon) onto prepared baking tray. Press down on each one gently with the back of a fork. Bake for 10 minutes only (do not over-bake); the cookies will still be slightly soft but will harden as they cool. Preparation time does not include the time it would take to make your own peanut butter, as I did! You can replace the tahini with more peanut butter, if desired. Will try pb spelts! Beautiful photos. Yummm! 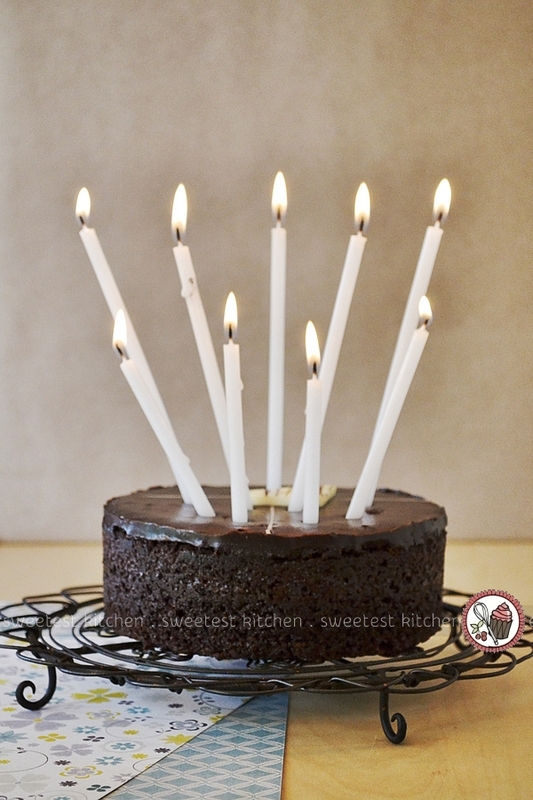 You can definitely make baked goods without all that butter and sugar – just look at all the sweet recipes on my blog! Hi there, your photography is beautiful and I’m enjoying your blog so much! I found you through Kristy at Southern-in-law. I grew up in the USA, too. I just recently moved to Australia ( Queensland) in November. I look forward to reading more of your recipes! Yummy! These look very good! I love peanut butter cookies. The whole grain spelt really gives it a nice twist. I love your pictures too 🙂 Thanks for sharing! I just made these except I substituted with almond butter and used sesame seeds instead as I had no tahini. Winner! Hi, I’m not really allowed to eat sugar, can I substitute the maple syrup with something like stivia or is the maple syrup necessary for the texture or something? A little late for you, I know, but if anybody else has this same problem, here’s an answer: yes, you can substitute syrup for stevia, but you’ll need to make up for the moisture in the maple syrup with another liquid. You could dissolve the stevia in water, for example. Hi there i made these and found them too salty. I used sea salt flakes so perhaps would have been better to out it in with the wet ingredients so it is evenly combined. Overall they were fine and looked nice but I wouldn’t make them again, or would half the salt. Hi Jamieanne! Thanks for the recipe! I just made these… and scoffed down 3! I’m a newly pregnant woman, and these cured my peanut cravings! I’ve heard that if women (who aren’t allergic to nuts) consume tree nuts whilst pregnant, will more likely have children who aren’t allergic to nuts. My little nephew is allergic to peanuts so I’m very conscious of nut allergies. I like your idea of making your own peanut butter. At my local store, I found a jar of peanut butter that is made of 100% peanuts – no added sugar, salt or palm oil. Love it! Will try to make the cookies this afternoon. Do yo bake a lot with spelt flour? I do, I use only spelt and nut flours. I also like your explanations, especially the biblical ones about the roots. (btw I buy dinkel, because currently I live in Germany). Did you ever made Jews challa? I found an original recipe where the spelt flour was used. In case you would like to see here is a link to my blog/recipe. (it’s in my native language, but the translator is top left). Made these. Very disappointed. Way too much salt! So sad to waste expensive, organic, homemade ingredients and my time on this recipe. They also crumbled apart so badly that even if I were to store them, it would have to be in a single layer. Into the trash they went. The cookies look fantastic! I’ll try to make these and wish me luck to have results like these marvelous cookies! I just made these cookies and they are, bomb.com!! I’m def bookmarking your blog to keep up with your recipes!! Just made them. And they’re a little too salty (would definitely half the salt) and too soft and crumbly. How do I make them more crisp and crumble less?